The influenza A virus M2 protein, the prototype viral ion channel, mediates passage through low-pH compartments during viral entry and maturation. 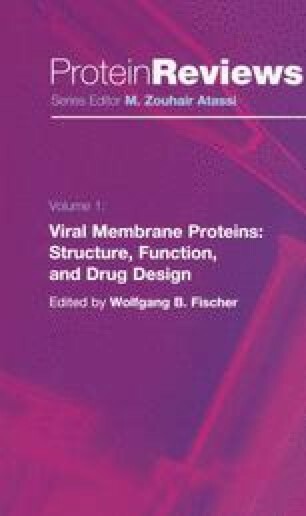 Its proton channel activity is essential for virus uncoating and in certain cases for the maturation of viral hemagglutinin (HA). A fluorimetric assay of ion translocation by membrane-reconstituted M2 disclosed the nature of the conducted ions, protons, and allowed the determination of an average unitary current in the attoampere range. Upon hyperexpression in heterologous systems, M2 is cytotoxic in correlation to pH gradients at the cytoplasmic membrane. An M2 mutant with relaxed cation selectivity proved significantly more cytotoxic and was exploited as a conditional-lethal transgene. M2 has an additional function, not inhibited by channel blockers, as a cofactor in virus budding where it interacts with M1 to determine virus morphology—spherical or filamentous. The M2 protein has recently been shown to bind cholesterol, but cholesterol appeared nonessential for ion channel activity. The M2 endodomain contains a cholesterol-binding motif, which also occurs in HIV gp41. We propose that M2 is targeted to the raft periphery enabling it to co-locate with HA and NA during apical transport. In a new model of influenza virus morphogenesis M2 may cluster or merge separate rafts into viral envelope and act as a fission (pinching-off) factor during virus budding.